Now I have new products from Växbo Linen in Hälsingland in my shop "Butik Lena Maria". In Växbo are the best preserved environments from the flax preparation heyday. The small flax processing plants at "Trolldalen" (Troll Valley) testify to the the flax-growing peasants' use of hydropower. On this historic ground and with that cultural heritage in the back Växbo Linen started in 1989. Dishcloths in different colors. Linen has the unique ability to absorb moisture better and then dry faster than any other natural material. Initially, the production was solely focused on spinning, but after a few years the linen weaving mill also started. 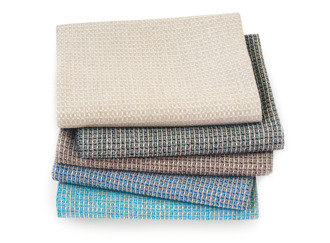 All products are woven in 100% linen. They are 13 employees who together weave, sew and sell these beautiful linen products. Their vision is for Växbo Linen to develop, manufacture and market modern linen products with the intent to arouse desire and create added value for customers and employees and to pass on a unique craftsmanship. Their work is based on three guiding principles that permeate their entire operations. Växbo Linen is: - Solid - Personal - Innovative.